I’m happy to announce OpenOffice.org 3.2 rc4 packages for openSUSE. They are available in the Build Service OpenOffice:org:UNSTABLE project and include many upstream and Go-oo fixes. See also overview of integrated features and enhancements. Please, look for more details about the openSUSE OOo build on the wiki page. As usual, we kindly ask any interested beta testers to try the package and report bugs. See also the list of known bugs. I am sorry for the huge delay. We spent a lot of time with debugging some java related problems. Upstream released rc4 in the meantime, so I decided to skip the rc3 packages for openSUSE. Then, if you tell vim to open gpg encrypted file, it will ask for passphrase, transparently decrypts it and after you make changes, it will encrypt the file again. Now with the aid of the Hermes notification system, you can find out as soon as a new version of software you’re interested in is uploaded to the openSUSE Build Service. Here we see the test KDE feed I setup in the News widget. You can setup your own new version feeds by going to the Hermes web interface with your openSUSE login, My Subscriptions, then scroll to the bottom of the page and enter the ‘expert interface’. Add a new subscription of message type ‘OBS_SRCSRV_VERSION_CHANGE’ then set the appropriate digest period and the delivery mode to Web/RSS Newsfeed. Finally add a Filter for ‘packagename’ and probably ‘containsitem’ then some part of the project name you are interested in. 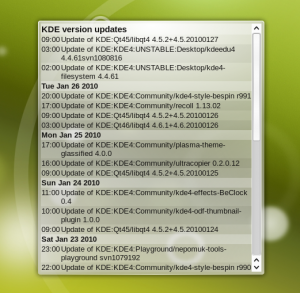 I used ‘KDE:’ for the above feed, but you could use a more complete project name to include only for example new versions in KDE:KDE4:Factory:Desktop. Save your changes, and you can then go to the ‘My Feeds’ link in the Hermes toolbox at left to get the feed URL. To add a feed name, edit the notification and add a description. Now all you research students and other compulsive update fans needn’t ‘zypper dup’ 10 times a day to find out if your favourite software changed. Enhancement #434757 is done! For those new to FOSDEM, all I can say is it is a blast! Seriously, there are people from all over the world there talking about all sorts of things – personally I’m not overly bothered about most of the talks. For me the biggest win from FOSDEM is the social aspect. The pre-event drinks on Friday night are great, and yes I have to admit there is one thing that those adorable little blue Belgians do right – Beer!!! I have met many a great person, some of whom I had never heard of before but many whom I had. The atmosphere just rules. As for the main event, like I said there are loads of talks (have a look at the schedule) and there are lots of stands with some giving away some nifty swag. I will be lurking around the openSUSE stand (hopefully helping out & not getting in the way) and also going to speak to some of the other distros/projects. I’m hoping to be able to speak to some of the lovely Intel folk (and others) about Moblin, as well as speaking to some of the e-mail/messaging projects to see what the Bongo Project can learn. One key item is that of synchronising of data. So if you are in the vicinity of, or can be in the area, head on over to FOSDEM. You’ll be able to meet face to face with many luminaries – not just from openSUSE but from the FOSS world in general. By the way for the uninitiated our very own yaloki is also one of the organisers so be good to him as he and the others have been working their little socks off! I’ve tried this in xfce & kde4 desktop, and now don’t have any strange grabbing off keyboard & mouse. I can now easily send the ctrl+alt+del evil sequence to some windows vms. Many ubuntu 9.10 guys are also hit by this problem ! 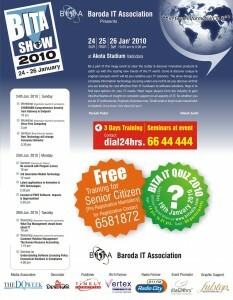 Baroda IT Association(BITA) presents the biggest IT exhibition in Gujarat, India on 24 – 26 January 2010 at the Akota Stadium, Baroda. We will be there with openSUSE Education Li-f-e DVDs, so come look us up. Bring USB stick (min 4GB) if you want Li-f-e on the stick. Locking down the desktop may be an important functionality for you or it may be a major annoyance. This depends on your point of view and on which side of the administration fence you are. There are certainly many use cases where the restriction of desktop functionality is very important. One such use case may be the configuration of machines in a teaching environment. For GNOME, Sabayon is a GUI tool that allows you to set up the desktop to your liking and store the configuration as a profile. Profiles can be deployed to any system allowing the machine to display the desired desktop based on who logs into the machine. Further you may also use Pessulus to lock down the GNOME desktop. Additional information may also be found in the GNOME Admin Guide. In addition to the options mentioned above there is a command line tool (gconftool-2) you may use to create customizations from the command line. The gconftool-2 tool creates entries in the configuration tree for gconfd, the GNOME configuration daemon. The GNOME configuration is stored in XML files named %gconf.xml in a directory structure where directory names indicate the part of the desktop or GNOME application to which the features set in the XML file apply. For example options set in apps/nautilus/desktop/%gconf.xml determine the behavior of Nautilus when the desktop is drawn. For users the configuration tree is stored in $HOME/.gconf allowing users to configure the desktop appearance and application behavior to their liking. For system wide configuration, configuration trees exist in /etc/gconf. Within the /etc/gconf directory structure the gconf.xml.mandatory directory tree represents the configuration tree that is used to lock down the system. Options specified in the /etc/gconf/gconf.xml.mandatory configuration tree cannot be altered by the user. --type boolean --set /apps/nautilus/desktop/volumes_visible "false"
The path of the parameter to be set can be determined by using the gconf-editor tool. The gconf-editor is an editor/browser for the GNOME configuration tree and is very helpful when trying to find features to be manipulated within the GNOME configuration directory. Detailed information about the gconf-editor can be found here. Knowing the path for the option to be set and the location of the configuration tree that contains the locked down configuration (/etc/gconf/gconf.xml.mandatory) it is easy enough to create a script that can be executed when a machine is set up to configure the desktop appearance as desired. If you are using KIWI to create system images the gconftool-2 commands can easily be added to the config.sh script to configure the desktop behavior in the image. Creating a self installing CD/DVD or USB stick with KIWI allows you to deploy your pre-configured desktop image when ever a new system needs to be commissioned. The gconftool-2 command creates the tree in the location specified with the –config-source command line option. Thus you can switch between manual edits and using a tool very easily. Once you have your tree you can package it up as an RPM and also add it to your auto YaST deployment if you are using this methodology. With the available tools and/or by editing the configuration files directly locking down the GNOME desktop is relatively straight forward. The tricky part often is to find the correct file or the correct button to push for the desired behavior. This is where gconf-editor is the very valuable browser you are looking for. I’m happy to announce OpenOffice.org 3.2 rc2 packages for openSUSE. They are available in the Build Service OpenOffice:org:UNSTABLE project and include many upstream and Go-oo fixes. See also overview of integrated features and enhancements. Please, look for more details about the openSUSE OOo build on the wiki page. During the X-mas holidays Kolab, the groupware server got a stable repository for 11.1 and 11.2 on the openSUSE build service (OBS). All packages that are not provided by the openSUSE base distribution have been copied (using osc copypac) to the STABLE repository. Another possiblity to achieve the same result could be by making a fixed link to the unstable package using osc linkpac -r <rev>. Once the unstable package works again the link could be updated with osc setlinkrev -r <newrev> to point to the working revision or updated revision. The stable repository already shows its benefits, as cyrus-imapd was updated from version 2.3.14 to 2.3.16 in the server:mail, being the cyrus-imapd development repository for Factory. As the cyrus-imapd package in kolab:UNSTABLE links to the server:mail one, it no longer builds as the kolab patches no longer apply. Unfortunately my computer went South, and real package development is at the moment not possible. A good thing to mention here is, that cyrus-imapd-2.3.16 includes patches that are needed for Kolab and which have been in the review queue for multiple years! Just before X-mas Kolab-2.2.3 was announced. This version is not used in the openSUSE packages, as we package the version from trunk. After the 2.2.3 release the kolab development, moved back to trunk and the next version will be from trunk. During the 8th annual KDE PIM meeting in Osnabrück, Northern Germany Kolab got some attention as well, with the following exciting announcement: KDAB and Intevation will be working on making a functional PIM suite and Kolab Groupware client based on Kontact for mobile platforms.